Feringgi Grill continues to delight diners with inventive creations. Penang’s Feringgi Grill pampers gourmands with epicurean indulgences and refined experiences. The restaurant, located at Shangri-La’s Rasa Sayang Resort and Spa in Penang, has a reputation for good cuisine and great service, reflected in the many accolades garnered over the years. The restaurant was listed in the “101 Best Hotel Restaurants Around The World” by New York’s The Daily Meal in 2013, and cited as one of “Asia’s Finest Restaurants” in the Miele Guide’s 2011/12 and 2013/14 editions. Currently helmed by chef de cuisine Matthias Tretbar, Feringgi Grill continues to delight diners with inventive creations that appear fundamentally simple, but elevated with unique flavours, meticulous technique and visual appeal. The grill’s elegant ambience, with rustic brick walls and expansive windows affording gorgeous views of resort gardens and the Batu Ferringhi coastline, accentuates the sensory experience. After a successful debut run last year, its White Asparagus Promotion is back by popular demand, offering a selection of 10 dishes incorporating the perennial vegetable, until May 31. “White asparagus tastes less bitter and more tender, compared with the typical green variety. To cultivate it, young shoots are covered with soil as they grow, so they are not exposed to sunlight and will not turn green. “This special menu showcases the versatility of this delicious vegetable,” the German chef said of the delicacy, a spring and summertime favourite in many parts of Europe. For starters, there is the piquant Pickled White Asparagus with Tomato Basil Salsa and Garlic Bread, whose crisp tartness is bound to awaken the taste buds. The Stir-Fried White and Green Asparagus with Strawberries, Rocket and Foie Gras is more complex. Tossed in zesty raspberry vinaigrette, the vegetables are the perfect foil for the rich and decadent goose live pate. Slurp up the smooth and flavourful, Caramelised White Asparagus Cream Soup with Smoked Salmon and Caviar, which is poured before your very eyes. There are six main course options, with the undoubted star being the Wagyu Beef Tenderloin, a luxuriously marbled cut that oozes juiciness. Equally tender are the Braised Beef Cheeks, which fall apart as you flake through them. 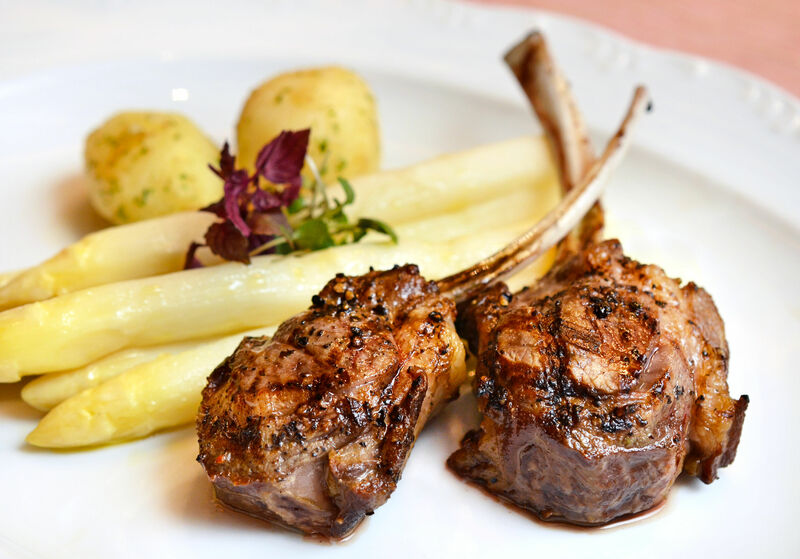 Chargrilled to savoury perfection, the succulent Lamb Chops are simply divine. Seafood aficionados may opt for chunky Panfried Scallops, decadent King Prawns or a slab of luscious Canadian Cod instead. Each main is served with a portion of ivory-hued asparagus spears, baby potatoes and a choice of Hollandaise, Bearnaise, Maltaise or Choron sauce. Sweet endings are ensured with the Grand Marnier Marinated Fresh Strawberries with Orange Yoghurt Mousse and Pistachio dessert — a kaleidoscopic platter of dainty elements. Besides the promotional items, diners can also look forward to new items in the a la carte menu — such as the Feringgi Salad, Confit Duck Ravioli, Lobster Croquette, Curry Pumpkin Cappucino, Beef Rossini, and Butter Poached Blue Shell Lobster. Decades-old classics like the Caesar Salad, Tomato Soup, Chateaubriand, Roast Prime Rib and Crepe Suzette, remain permanent fixtures. The Feringgi Grill is open from 6.30pm to 10.30pm daily. For reservations, call 04-888 8788.